Holley fuel pump flows 110 gph free flow at 6.5-8 psi maximum, these pumps maintain top performance without requiring a regulator. Fuel body housing allows rotating of 3/8'' NPT fuel inlet-outlet fittings on SB/BB-Chevy and SB/BB-Ford for custom installation. 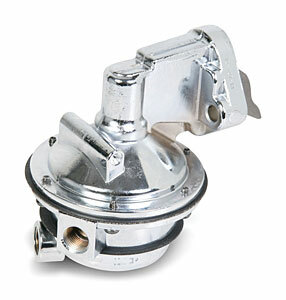 Ford FE, Pontiac and Chrysler fuel pumps use 1/4'' NPT fittings.